Today we streamed a conference centred around issues facing rural areas, so depopulation, access to broadband, financial stability. 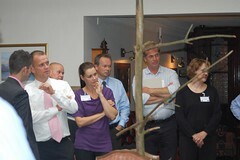 The most memorable workshop was this one where the speaker used a dead tree to get delegates engaged! The stream went well, especially since the hotel chosen was appropriately in the middle of the Norfolk countryside, and their broadband connection was initially limited, but we managed to get it boosted! Production September 10, 2009 West Sussex PCT shoot – beach day!